Martin Jordan attended an exhibition by Duffy. No, not that one - Brian Duffy, Legendary Lensman of the Sixties. Money, I could almost smell it as I walked down Jermyn Street in London’s West End. I passed one fancy art gallery after another, the kind you don’t ask the price, just the provenance. I was on my way to the Chris Beetles Gallery (www.chrisbeetles.com) to see the latest offerings by Brian Duffy. Latest? I’m giving you the wrong impression there; Brian Duffy hasn’t shown any work since 1979. Back then his work was hot and it became even hotter when he put it all into a fire and tried to burn it. "1978: Award-winning Smirnoff stills campaigns for Young and Rubican Agency. 1979: Decided to call it a day and burnt most of his negatives." Together with David Bailey and Terence Donovan, Duffy captured, and in many ways helped to create the 'swinging London' of the 1960's: a culture of high fashion and celebrity chic. Between them they dominated the London photographic scene. Luckily for us, and Duffy’s pension fund (he's a spritely 76 now) Camden council came to the rescue before all the work could be destroyed. The pyre of negatives was giving off so much acrid black smoke that his neighbours complained, causing the council to intervene. Since then the remaining work has languished in a cupboard until two years ago, when Duffy's son Chris started to go through the shoe boxes of negatives and saw the potential. The current exhibition realises that potential, and enables us to share it. Many of the photos are being seen publicly for the first time. Because Duffy was such a part of the London scene in the Sixties, I was really hoping that some glamorous and rock ‘n’ roll types might turn up for the bash. Maybe Joanna Lumley or Twiggy, a Rolling Stone or even a Beatle? Upon my arrival at the gallery a glass of champagne was thrust into my hand. The first thing to hit me was the number of people. The place was packed. The situation not helped by a film crew for the BBC (watch out for their forthcoming documentary on Duffy) making their way around with camera and lights. As I shuffled past the pictures hemmed in by a well-heeled crush, a cut glass accent brayed: "Caroline! Have you met Tarquin?" Caroline's pearly décolletage momentarily distracted me, as she air-kissed Tarquin, mwah, mwah. My attention back to the photos, I was really impressed by the ‘film quality’ of the work. Being a bit of a digital boy myself, I was amazed at how grainy many of the photos were. I soon got used to it however, and began to really appreciate the images. Not only are they great pictures in their own right, but they are also very much of their time, and decades later give a fascinating insight into that period: the fashions, the hairstyles, the cars, and the people. One of my favourite photos is the rather ungainly titled 'E-type Jaguar on the M1 motorway soon after it opened'. It was shot facing the car's long bonnet on a typically foggy day, with the headlights blazing. Fabulous. As well as the fashion shots, there are some great portraits, including those of a very young looking Michael Caine, John Lennon, Paul McCartney and Beatle producer George Martin. I also spotted Steptoe and Son's Wilfred Bramble, Academy Award winner Sidney Poitier and East End villain Reggie Kray 'boxing' with his Grandfather. All were shot in glorious black and white. There are 43 modern prints on display, all available in a limited edition of 50, selling for £1600 each. That would take the total sale proceeds to well over £3m - not bad for work that so nearly went up in smoke 30 years ago. The exhibition is open until 7th November, and is well worth a viewing. If you have a spare £1600, you might be tempted to buy one. If the upsurge of interest in collecting photography continues, it could be a great investment; and a photo is a lot more enjoyable to look at than a share certificate. Martin, we've had our differences but this is an excellent article. Well written, unbiased and informative. 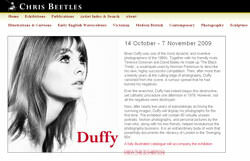 As a Duffy fan, and someone who saw the TV programme, you told me everything I wanted to know about his exhibition. I wish I had the money to buy an original print. The only thing I'd question is the assertion that Baily, Donovan and Duffy "dominated the London photographic scene." I think Barry Lattigan and Tony McGrath might have something to say about that. Nevertheless, your review was an excellent piece.